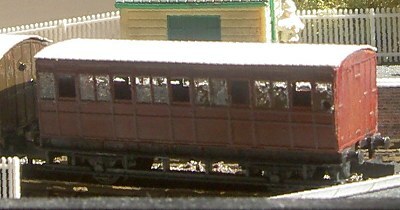 A fold up bodyshell and roof to produce one of the ex LT&SR four wheel coaches that survived on the Corringham Railway until the 1950s. The kit as supplied represents the coach in late condition. Designed to fit a Peco 15' chassis (not supplied). Simple fold up construction. Soldering recommended for the body corners but not required. With no duckets or roof vents and a direct fit to an RTR chassis this kit was designed to provide the easiest possible first steps introduction to etched kit building.